In every business organisation, operations management and strategic planning are two critical elements which are closely associated with each other (Stevenson & Hojati, 2007). Operations management can be defined as an area of management which if focused on aspects such as overseeing, designing, and controlling the process of production and redesigning various business operations in the production of goods and services (Krajewski & Ritzman, 1999). Role of operations has major importance when it comes to manufacturing based organisation, where production of some product takes place. In such context, operations can also be defined as a coordination of various activities which are part of the production process (Voss et al, 2002, pp.195-219). Operational management’s core aim is to ensure that in the end of the production cycle output should be such that it should have certain value for the customer (McCutcheon & Meredith, 1993, pp.239-256). Purpose of this task is to understand the concept of operations management and its association with strategic planning. Based on the case study, relevant analysis will be done to organize a typical production process and relevant techniques to the production of an operational plan will be discussed. Report for Task 1 is based on the example of a furniture supply company which provides finished goods to the leading furniture retailers. As part of their review process, company is reviewing its management of operations, so that it can further improve efficiency and effectiveness of the business. Customer service: The first aspect which reveals importance of operations management is the fact, that operations management helps an organisation to effectively utilize its resources, in order to fulfill requirements of the customer. Due to this reason, customer servicing becomes a key objective of the operations management. In terms of cost incurred, and time lapsed to deliver the product to the end customer, operations management plays an important role in deciding these two aspects (Heizer et al, 2004). For example if the furniture manufacturer company cannot fulfill demand of its retailers for making a cupboard of certain quality which is in demand, then its blame can be partially shifted towards the inefficiency in the process of operations management. Hence, often it has been said that providing right thing at a right cost and at right time is the key focus of the operations management, which helps the organisation in improving the customer service aspect. Resource utilization: Operations management is also important for an organisation because it helps in effective utilization of resources (Gaither, 1987). Even though customer servicing is important, but judicious utilization of resources available with the organisation is equally important as well. Hence, operations management helps in obtaining maximum effect from the resources or minimizing the loss or waste of resources. It is also important to understand that improvement in any of the objective often impacts the other objective in negative sense, hence it is important to ensure that the organisation tries to achieve the balance between the two objectives. Within an organisation there can be numerous operations functions. In this case the organisation under analysis is a furniture manufacturing company. Before identifying the operations functions for the furniture manufacturer, it is important to understand that the core functions remains the same across manufacturing industry (Russell & Taylor, 1998). Hence whether it is manufacturing of an automobile or manufacturing of a furniture the core concept of operations management will remain same. Below displayed image represents the overall process of operations management and various functions involved in it. The marketing (including sales) function: this function is responsible for communication of organisation’s furniture products to the retailer which helps in creation of customer requests for the product (Krajewski et al, 2007). The product/service development function: In the furniture company, this function is responsible for creation of new or modified products, so that future customer request can be generated, and existing customer requirements can be fulfilled (Chase, 2012). Hence it can be said that for a furniture company, there are multiple functions which are responsible for production of the final good delivered to the retailer. Input: In terms of input materials such as wood will be required. Since the operation is focused on transforming the raw material into physical product, hence material will be the core input. For example, for manufacturing of a wooden cupboard, process will involve input of wood (or metal), polish, customer requirement etc. Transformation process: Once the input is received and there is clear understanding about the desired output, transformation process begins. As part of the transformation process Furniture Company will create the desired furniture (in this case a cupboard) as per the customer specification. Output: Once the transformation process ends, a tangible product having some specific market or customer value is created (Stuart et al, 2002). Product created can be then shipped to the retailers for the selling process, often there are several organisation consider logistics as part of the operations management, but it is important to understand that logistics or shipping of the final product is part of the larger supply chain which the organisation is managing. As part of the process model for the Furniture Company, the product which will be produced towards the end of the process model will be tangible in nature. However, in generic sense it can be said that output from most types of operational process model is a mixture of goods and services, which completely depends on the fact that in which industry the organisation exists (Evans, 1997). For example output in a petrochemical based company will be different when compared to an organisation in furniture industry. In operations of an organisation, determination of what to measure is a key issue for performance measurement. In this context, transformation model can be taken as a baseline for classification of performance measures (Schonberger & Knod, 1994). Hence, there are three types of measure which can be identified dependent upon the point in the process that they provide information. These measures are also known as Three Es’-economy, efficiency and effectiveness. Economy: Measure of economy helps in determination of the cost associated with the goods and services which are required as inputs for the process of operation (Fitzsimmons & Fitzsimmons, 2006). There might be a misunderstanding that procuring the input material at the lowest possible cost is the most logical option for an organisation like Furniture Company. However this thought might not be correct in all the scenarios. 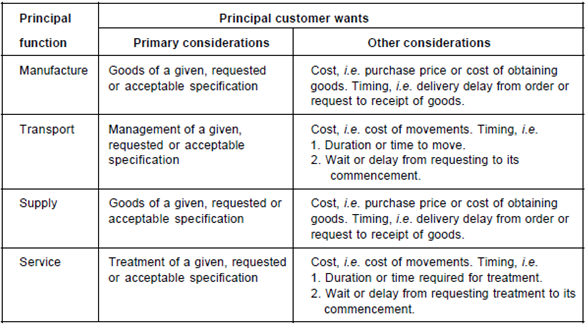 Objective of purchasing activities and its measure as performance depends on other three factors such as quality, quantity and timing of the purchase (Chase & Aquilano, 1989). Hence, for example if the furniture company decides to procure raw material in form of wood at high cost then current market price in a dull market season then obviously it is not wise decision, because high input cost will ultimately impact the final price of the product, and with low customer season retailers might find it hard to sell the high priced products. Efficiency: Measure of efficiency is a straightforward measure. It helps in analyzing the performance on the basis of input utilization and the final product produced (Thomas & Griffin. 1996, pp. 1-15). For example if the furniture is able to develop two cupboards in 1 day with $500, whereas its closest competitor is manufacturing same cupboards in same number and same time but at cost of $350 then definitely furniture company has efficiency related issues in its operational process. In a way this measure of efficiency helps the organisation to fine tune its operational process so that it can achieve optimum utilization of its resources, and achieve efficiency (Heizer et al, 2014, pp.438-450). Effectiveness: Measure of effectiveness measures the fact that, to what extent the product which has been developed as part of the transformational process has been able to meet customer expectation. Hence, if Furniture Company manufactures an iron cupboard with loose fittings, then end customer will never accept the product due to its poor quality, which means that all the input in terms of time and material gone into manufacturing of that iron cupboard will be going waste. One approach is to measure levels of customer satisfaction directly, for example, through customer satisfaction surveys. It might also be possible to use indirect measures of customer satisfaction, perhaps based on sales figures such as market share (Rotaru et al, 2014). In operations, there is constant focus on cost minimization of the transformation process and maximization of product quality. In an ideal operational process an organisation will always seek least possible input cost, with highest possible quality of the product to be manufactured. However, this idealistic condition is never achievable in real life scenario. In a cutting edge competitive environment, organisations are continuously trying to find ways through which they can reduce the cost of operations, but it is necessary to understand that in real life it has been seen the in order to achieve a high quality product, high quality raw material is required which comes at a high cost. For example, if the furniture company decides to build a cupboard with high grade iron, then it becomes obvious that cost of high grade iron will be much higher as compared to the normal iron used for the manufacturing. In such situation for the manufacturer there will be constant pressure on achieving cost minimization and quality maximization, which will be hard to achieve. In attempt to minimize the cost, at times manufacturer of the product might have severe negative impact on the quality of the final product. Achieving the balance between the two factors has become one of the major challenges for the organisations today. That is why organisation continuously focuses on strengthening their supplier network so that they are able to get cost optimization in their raw material required to produce a product. In operations five performance objectives cost, dependability, flexibility; quality and speed holds the key to success for any organisation. Dependability: As a performance objective, dependability factor helps in setting a baseline for the product in terms of its quality, which means that after production, how dependable a product will be. For example, furniture company famous for its wooden cupboard among retailers due to the fact that, the wooden cupboards it produces comes with a manufacturer warranty of 2 years, and majority of them do not have any issue in these two years, this aspect reflects the dependability aspect of the product and also highlights high performance of the organisation. Flexibility: In operations management, the process of operation such as production or transformation from input to output should be flexible in nature. For example, if there is an urgent order of 10 wooden cupboard to be manufactured through an assembly line which is made for table production, then true performance in terms of flexibility can be measured by the fact that how flexible is organisation in changing its operational procedures to adapt the sudden change (Slack et al, 2013). Quality: as mentioned in above sections also, quality is one of the most critical parameter through which performance can be judged. For example, finished product like cupboard might have various parameters on which its quality might be judged. These parameters might be like finishing of the product, its sturdiness, longevity etc. Speed: performance measure of speed is often related to the time which is taken to produce a product. Hence, if to manufacture a table it takes, 1 day for the furniture company; whereas its competitor takes 12 hours then definitely Furniture Company has performance issues with speed of its operational processes. Hence, overall it can be said that operational management is a critical part of the business. It has major impact the strategic planning of the organisation. For example with focus on operations, organisation will be able to identify the input required for producing a product which meets the customer requirement, also since operations management has impact on the customer satisfaction, hence it becomes important during the strategy preparation to focus upon various elements associated with the operations management. In operations management Critical Path Analysis (CPA) has an important role to play. It is a project management tool that helps in identifying all the individual activities and processes that makes up the larger project. CPA helps in identification of the order in which each activity has to be taken up. It reflects that which activity can be only taken up once the activity preceding it is completed. Critical path helps in identification of the path or route in the production cycle which has no spare time in any of the activities and can be mentioned as the most efficient path to complete the production. Hence network planning can be defined as the process of identifying the network through which an entire production will take place. Design and discuss possible layouts for producing furniture and clearly define operational outcomes. Hence when all the above processes are completed, these individual parts are bolted together, and complete furniture is made. In this process it is important to understand that every part of the main product is being manufactured separately. Such layout planning helps in better customization and efficiency as each production process is dedicated for manufacturing of certain specific item only. There are multiple approaches which can be used for project management quality control in sales, stock and purchase process. Sales: In sales process, focus should be on ensuring a minimum credit limit for the customer. This will ensure that there are no long pending dues on the retailers. Furniture Company should focus on only those retailers who are able to complete the sales process and complete the payment for the received product in time. Purchase & Stock: For stock, Furniture Company should focus on Just in Time (JIT) approach. Which means that it has to stock only those items which are already demanded or will be demanded in recent future. Which means, rather than manufacturing the products in anticipation from market and piling up the inventory, Furniture Company’s operational process should be flexible enough to manufacture on demand. This will help in reducing any wastage on unsold product due to poor demand. Overall, it can be said that management approach should be focused on close integration of sales, purchase and stock processes. These processes are integral to the production cycle of a product. Hence, having tight control on these processes is essential to achieve high efficiency. Also, by following approaches like JIT, Furniture Company will be able to regularize its supply of raw material, and in turn giving stability to the purchase process. Based on above analysis, it is clear, that operations management is a complex process which consists of various functions in an organisation. When it comes to strategic planning, operations management has critical role in it. Functions of operations defined above helps the organisation to anticipate the demand, procure the raw material and accordingly manufacture the products. In a way, operations management lays the foundation of entire business strategy, on the basis of which organisation goes into the market with its product or services. Aquilano, N. J., Chase, R. B., & Davis, M. M. 1991. Fundamentals of operations management. Homewood: Irwin. Chase, J. 2012. Operations management. Tata McGraw-Hill. Chase, R. B., & Aquilano, N. J. 1989. Production and operations management: A life cycle approach (pp. 748-848). Homewood, IL: Irwin. Evans, J. R. 1997. Production/operations management: Quality, performance, and value. St Paul, MN: West Publishing Company. Fitzsimmons, J. A., & Fitzsimmons, M. J. 2006. Service management: operations, strategy, and information technology. New York: McGraw-Hill. Gaither, N. 1987. Production and operations management: A problem-solving and decision-making approach. Dryden Press. Heizer, J. H., Griffin, P., & Render, B. 2014. Operations Management. Supply-chain management, 434(436), 438-450. Heizer, J. H., Render, B., & Weiss, H. J. 2004. Operations management (Vol. 8). Pearson Prentice Hall. Krajewski, L. J., & Ritzman, L. P. 1999. Operations management. Reading, MA ua: Addison Wesley. Krajewski, L. J., Ritzman, L. P., & Malhotra, M. K. 2007. Operations management: processes and value chains. McCutcheon, D. M., & Meredith, J. R. 1993. Conducting case study research in operations management. Journal of Operations Management, 11(3), 239-256. Rotaru, K., Churilov, L., & Flitman, A. 2014. Can critical realism enable a journey from description to understanding in operations and supply chain management?. Supply Chain Management: An International Journal, 19(2), 117-125. Russell, R. S., & Taylor, B. W. 1998. Operations management: Focusing on quality and competitiveness. Upper Saddle River, New Jersey: Prentice Hall. Schonberger, R. J., & Knod, E. M. 1994. Operations management: Continuous improvement. Slack, N., Brandon-Jones, A., & Johnston, R. 2013. Operations management. Pearson. Slack, N., Chambers, S., & Johnston, R. 2010. Operations management. Pearson Education. Stevenson, W. J., & Hojati, M. 2007. Operations management (Vol. 8). Boston: McGraw-Hill/Irwin. Stuart, I., McCutcheon, D., Handfield, R., McLachlin, R., & Samson, D. 2002. Effective case research in operations management: a process perspective. Journal of Operations Management, 20(5), 419-433. Voss, C., Tsikriktsis, N., & Frohlich, M. 2002. Case research in operations management. International journal of operations & production management, 22(2), 195-219.